On Tuesday 5th March, the first session of NGL International’s “The Transformation Dialogues” took place at the beautiful and inspiring headquarters of Dutch fashion designer and artist, Mart Visser, in Amsterdam. Some 50 international executives saw Mart kick off the session by sharing some of his personal transformation experiences. He told his spellbound audience that in order to make a successful transformation journey you need to follow your dream, use your intuition, remain authentic and just get on with it by grasping opportunities and overcoming difficulties. Apparent setbacks actually offer wonderful opportunities. As Johan Cruyff, the Dutch soccer icon, used to say: “Every disadvantage, has it’s own advantage”. 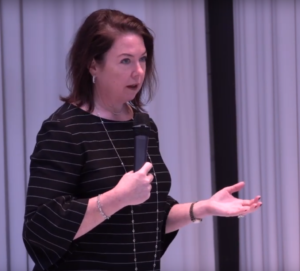 NGL International’s guest of honour was Stephanie Miller, CEO of Intertrust, a global leader in providing expert administrative services to clients operating and investing in the international business environment. 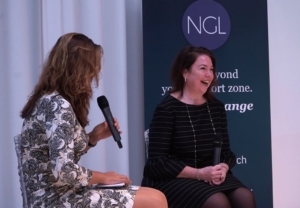 Stephanie was interviewed by the founder and managing partner of NGL International Bercan Günel about her transformation journey at Intertrust. Stephanie proved to be an energetic, open and engaging leader who was quite willing to share her own transformation experiences from the past and the present. Key ingredients of a successful transformation according to Stephanie are first and foremost a clear definition of the reason to change. Creating a common purpose for the organization, restoring pride in the organization amongst its people and to create a true sense of belonging are prerequisites. Putting in loads of personal energy, reaching out to and recognition of individuals and teams are building blocks that coupled with role model behavior as a leader will unleash energy of others. Being accessible as a leader and willing to listen and ask questions enable people to work together on a clear strategy and purpose. Involving all stakeholders, being inclusive and having fun make the transformation journey a worthwhile experience and cause. Last but not least make sure that you stick to what you’re good at and never stop innovating will result in the necessary transformation. Whilst you’re at it never stop building consensus and allow people time to contribute to and digest the changes. After a short break during which the guests exchanged their personal experiences at transformation and got to know each other, Bercan facilitated a question and answer session which led to a very lively and insightful dialogue. NGL International’s partner Wim Dufourné presented a summary of the key take aways and briefly introduced the mission and ways of working of NGL International. Next guests of honor will include Jo Maes, CEO Ordina and Annemieke den Otter, CFO Ordina on May 15 and Helen Mets, DSM’s President of Resins & Functional Materials on June 18.